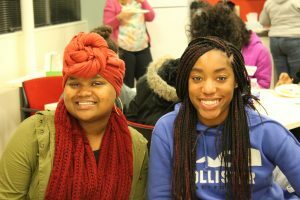 YWIL Philanthropy Night - Girls Inc.
On Monday, November 26th, girls in our Young Women in Leadership (YWIL) program participated in a workshop focused on philanthropy. During the workshop, our girls and staff got a chance to thank all of our generous donors and talk about the definition of philanthropy. First, the staff introduced themselves and explained how they each got started working at a non-profit organization and discussed their academic background. The YWIL girls got the chance to ask questions about how non-profits work and the benefits of working for one. We also discussed the history of philanthropy and why it’s important. In case you didn’t know, the word “philanthropy” is derived from the Greek word roughly meaning “love of mankind.” At its core, it is a love of humanity. A common definition might be giving gifts of “time, talent, and treasure” to help make life better for other people. We also covered the role of philanthropy in American society by explaining who gives and why they do so. Then we discussed how donors and volunteers make programs like YWIL possible and why fundraising, cultivation, and stewardship are important. From there, the girls split into groups and went around to a couple different stations. At one station, the girls wrote thank-you card to donors, thanking them for all their contributions to Girls Inc. Indy and how their donations have helped them succeed as young women. 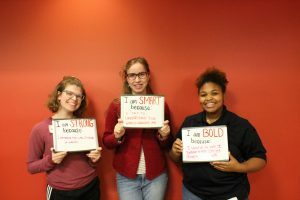 At another station, the girls wrote on white boards that said, “I am strong/smart/bold because…” and filled them in with their own personal testimonies. The girls also did short videos answering questions about how Girls Inc. Indy has supported their growth and what it means to be strong, smart, and bold! Overall, the girls had a great time learning about philanthropy, why it is important, and how they can get involved. Some even left the workshop inspired to pursue a career in the nonprofit sector one day!